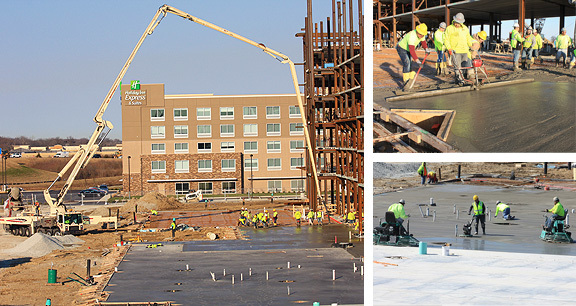 Project obstacles and solutions: In August 2016, Embassy Suites by Hilton broke ground on a new 192 suite hotel and 21,000 square foot conference center in Noblesville, Indiana. The new facility is designed to accommodate meetings of up to 2,000 persons. Amenities include an indoor swimming pool and an on-site restaurant. Sun Development and Management served as site developer and general contractor. Lithko did all of the concrete foundations and flatwork. Weather became a challenge during the pouring of the slab floors. IMI supplied concrete for the footings and floor slabs. The floors were specified to meet a strength of 4,000-5,000 psi. Lithko poured the floors at a depth of 4-8 inches. The early pours were done in cold weather. IMI supplied imix FreezeGuard for the slabs poured in December. This mix is designed to set up quickly in cold weather without the need for any blankets or other warming techniques. In March, the floors were completed. The real challenge came about when spring weather caused unexpected high wind gusts and dry air during one key day when the floors were being poured. These conditions can cause water to evaporate too quickly from the surface of the concrete, which results in cracks. Winds picked up after the pour was started and was gusting near 40 mph. IMI supplied Lithko with an evaporation retardant, which they diligently applied to the concrete after each finishing operation. Despite the wind, the concrete slabs did not have any surface cracking due to plastic shrinkage, drying shrinkage, or scaling. IMI supplied 3,500 yards of concrete for the floors. For more information on safeguarding concrete during high evaporation days, click here or contact the sales representative for the concrete plant nearest your location. Click here.